Church theater seating is a fixed option and it provides a defined seating space for the audience. Sanctuary theatre seating offers an exceptional long term value and provides a higher seating capacity. Our church theatre seating widths range from 19″ to 23″ and armrests are available in fixed or flip up options. Seating capacity increases as much as 20% when theatre seating is utilized over traditional church pew seating. Radius configurations are available to achieve better sight lines. Replacement of individual seat panels are easy. 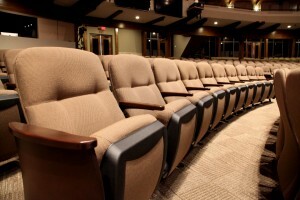 To eliminate noise, theatre seating by Church Interiors utilizes a patented quiet rise seat. Call Today for Your Free Seating Layout!